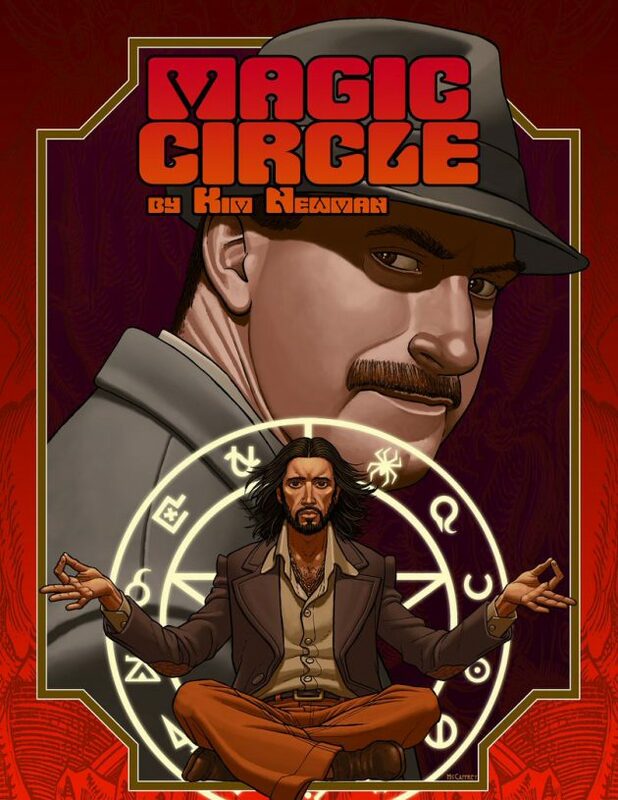 In what must be a first for the British stage, the Brother Wolf theatre company is conducting an arcane magic ritual for their latest production, Magic Circle, a two-handed mystery written by novelist Kim Newman, whose inspirations include real-life magician Aleister Crowley, the weird fiction HP Lovecraft and Dennis Wheatley’s occult masterpiece The Devil Rides Out. And if you are a fan, then you are in for a treat. It’s circa 1970 and in a room at Calme Manor, where some gruesome murders have taken place, a protective chalk circle has been drawn. 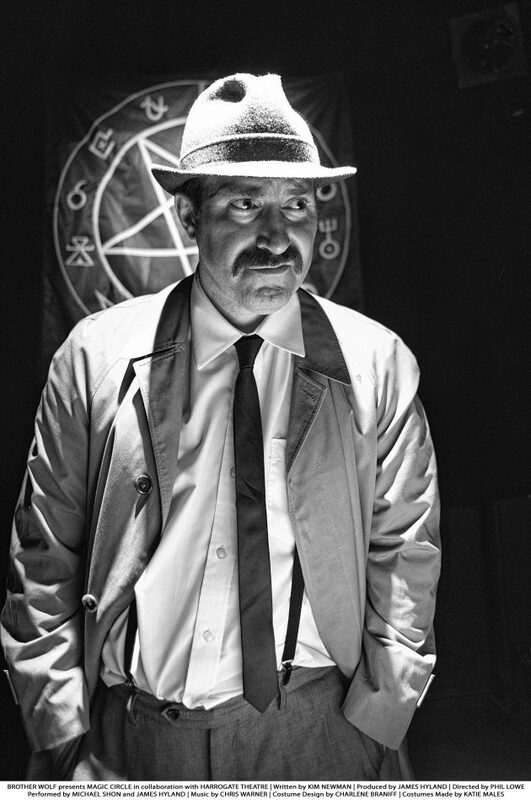 Inside sits Professor Harry Cutley (Michael Shon), an academic and occultist who plans to spend the night undoing a dangerous spell cast by a former acolyte. 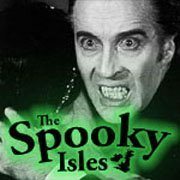 This is the first full-length dramatic work for Kim Newman, best known as the author of the Anno Dracula novels (and comics) and for his insightful film reviews, and I must admit I was crossing my fingers that it would be better than his first stage production, The Hallowe’en Sessions – part of the portmanteau chiller The Ghost Train Doesn’t Stop Here Anymore – which played at the Leicester Square Theatre but was stifled by mis-direction. But I got my wish, as director Phil Lowe has successfully breathed theatrical life into Newman’s intelligent and witty script (OMG! Sooty’s a satanic avatar! ), which explores the power of words via an occult narrative (clever stuff indeed). 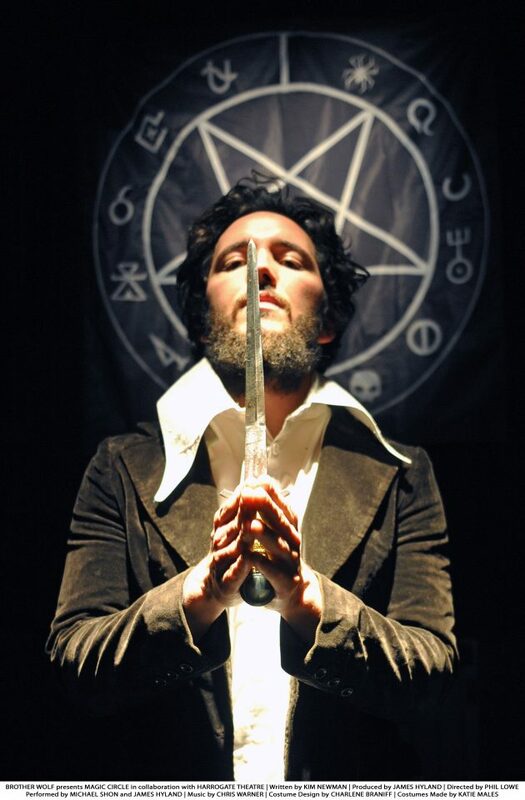 The intense proceedings are maximised by the use of the most minimal of sets, equipped with little more than that chalk circle, some ceremonial magic items, and a bundle of clothes neatly folded in a corner of the blacked-out stage – plus a pentagram designed with Newman’s own esoteric symbols. Such minimalism allows the audience to visualise the off-stage action (like the deaths describes in gory detail) and to ponder over the true intentions of Shon’s obsessive Professor of Comparative Religions and Hyland’s skeptical copper, who is trying to lure the hip occultist out of his circle, but never can cross (now why is it?). Both actors excel in their respective parts, with Hyland’s surly copper coming off like a cross between Alfred Marks’ DS Bellaver in Scream and Scream Again (1970) and Laurence Olivier’s down-at-hell Archie in The Entertainer (1960), while Shon’s hippy occultit possesses the same arrogance as Dean Stockwell’s Wilbur Whateley in The Dunwich Horror (1970). And thanks to Newman’s trickster narrative, the duo get to showcase their vast range as they lure audiences into the author’s eerie mystery – one that’s guaranteed to leave you breathless by the end. Posted on September 2, 2017, in Horror, Must See, Theatre and tagged James Hyland, Kim Newman, Magic Circle, Michael Shon, Occult, Supernatural, Theatre. Bookmark the permalink. Leave a comment.